A recent analysis by the Pew Research Center of World Bank data found that money sent by immigrants to their home countries in sub-Saharan Africa reached a record 41 billion dollars in 2017. This represents a 10 percent jump in remittances on the previous year, the largest annual growth for any world region, according to the study. A recent analysis released by the Pew Research Center on a collection of World Bank data said that money sent by immigrants to their home countries in sub-Saharan Africa reached a record 41 billion Dollars in 2017. This represents a 10 percent jump in remittances on the previous year, the largest annual growth for any world region, according to the study’s authors. The center said in a statement that the increase followed a decline in remittances to sub-Saharan Africa registered in 2016, when the area recorded a 9 percent decrease over the previous year. It was the largest regional drop worldwide, the center said. Immigrants worldwide sent a record 625 billion dollars back to their home countries in 2017, a 7 percent increase from the previous year, the study said. Strong economic growth in many major destination regions, stabilizing oil prices and the appreciation of currencies against the US dollar contributed to fuel the first worldwide increase in remittances since 2014, according to World Bank data cited by the center. Remittances subsequently shrank in 2015 and 2016, the first back-to-back decline in over three decades. The Pew Research Center stressed that the overall amount of money sent by migrants back home is probably far more than the current estimates as these numbers only include funds wired through official channels like banks. The analysis reported that almost one in four migrants (23% percent) from sub-Saharan African countries live in Europe and the US where recent economic growth has helped sub-Saharan African immigrants send home a greater quantity of remittances. “Nigeria, Ghana, Senegal and Kenya received the most remittances among sub-Saharan nations in 2017. These four countries are also among the leading origin countries for sub-Saharan migrants living in Europe and the US,” the center added. “Since 2009, Nigeria has received more than half of all remittances sent each year to sub-Saharan African countries, by far the largest share of any country in the region,” the Pew study explained. Nigeria’s regional dominance can be compared to Mexico's in South America and the Caribbean. In 2017, a record 22 billion dollars in remittances were sent to Nigeria, which has the region's largest population and economy, although its population of 1.3 million Nigerians who have emigrated is smaller than that of Somalia (2 million) and South Sudan (1.8 million). 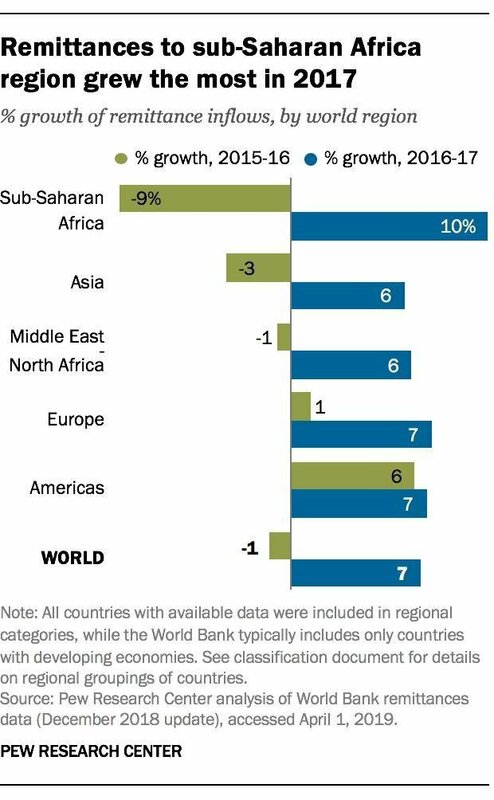 Remittances towards sub-Saharan Africa are expected to continue rising in the future, according to the World Bank. That’s because the region's population growth is expected to continue, which provides the potential to boost migration and thus remittances sent to the region.